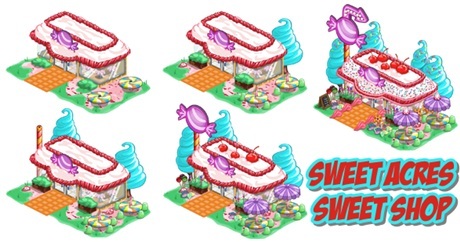 FarmVille Sweet Shop is a new crafting building that players will receive once they traveled to the new farm extension the Sweet Acres. The Sweet Shop (not to be mistaken with Sweet Shoppe of Winter Wonderland) is like the previous crafting building Yarn Barn and Dairy where players will be receiving orders from NPC and they need fulfill these orders. Once all the order was fulfilled it will give the designated reward.